The slow-moving fog encompasses me in an eerie embrace, as the world is lost in a sea of gray. It presses against my chest, questioning my presence, before deeming my motives honorable. The pregnant mass delivers robust raindrops, splashing serenely to the earth around me. I breathe in the scent of replenished life and nourished foliage, releasing my tangled anchor of human emotions on my exhale. The early-morning birds orchestrate a performance, with their flight and song. Wings imitate a gentle flute solo as they swish expertly through the air, and voices rise to complete the harmony, trilling timidly, returning each others’ questioning calls. I sit immobile on a stone bench, observing the flurry of activity around me, invisible to the average eye. Our species is always in such a rush, myself included, but where are we all running to? Or running from in my case; however, I learned long ago that no matter how fast I go I can never accomplish escaping myself. A deep-seated chill seeps into my thighs as the stone exchanges my warmth for its night-gathered cold. I accept the barter, as the stone has so graciously allowed me a place to sit and watch the perfect synchronicities of the world unfold around me. Finally my race has ended. “Vamonos, vamonos.” A young Peruvian girl ushers me through a rickety, handmade gate and up onto a grassy plateau. A dog follows close behind, white fur matted in knots and tinted a light brown from the mud. “Es mi perro, Ojas,” she declares, as she lovingly picks bugs out of his fur. Although I love dogs, I can see fleas jumping off this one from ten feet away, so I decide to admire from a distance. “Muy bonita,” I reply “Quieres mirar a un photo mi perro?” I think I relayed my question correctly, as she grins at me nodding enthusiastically, versus looking at me in confusion. A few days ago at the market I was trying to tell one of the hat vendors that I have a big head and accidentally proclaimed I have a big squash. I’ve been trying to keep my verbal failures to a minimum since then. I pull out my phone and scroll through my photo album, displaying pictures of my faithful pit bull Hazel. “Que hermosa!” the girl exclaims, fawning over the snapshots. “Como te llamas?” I ask my new friend. Fernanda grins at me, proud of herself for remembering the number in English. I smile back, standing up from the log we are perched on, and motion that I need to set up my tent. She follows me over to a welcoming patch of grass and grabs the other end of my tarp, helping me lay it out flat. She continues to aid me in setting up my shelter, pounding in stakes expertly, and gently attaching the rainfly. “You’ve done this a couple of times before, haven’t you?” I tease. She just smiles goofily back at me, most likely not understanding my English. I take off my simple necklace, a black stone pendant wrapped in gold wiring, and place it over her head. She looks up at me, a massive grin splitting her face in two. “Que, hermosa!” she croons, and wraps her hand around it protectively. She gives me one last smile in return and then skips back out the gate, down to her house. 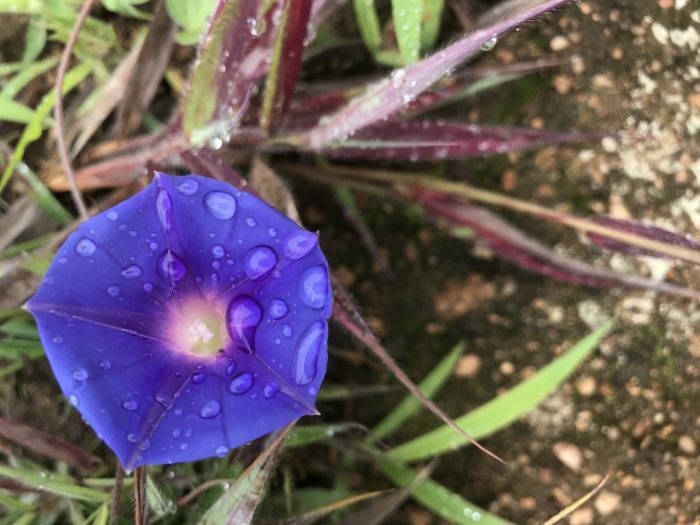 I careen down the muddy, steep-sloped trail; my hiking shoes gathering massive clumps of light brown earth, shoelaces buried under the thick layers. I feel giddy, and adrenaline is coursing through the solid muscles of my calves and my heart is dancing rhythmically. These are the usual symptoms that I look forward to when starting a new trail, especially when I am solo and can give myself over to them completely. The energy from the plants and mountains around me absorb into my body from my feet, giving me a stronger high than any drug has ever been able to accomplish. Wildflowers burst into a mirage of color on either side of me, more varied than any box of Crayola crayons on the market (yes, including the super-duper 120 pack with the buil- in crayon sharpener). The fog has been chaperoned off to other parts by a warm breeze and the sun is tirelessly trying to break through the mass of clouds high above. Every direction I look are stoic mountains, standing majestically and crowned with a halo of wispy clouds. I sing snippets of Portugal the Man songs as an offering to being granted the privilege of experiencing pure beauty as I attempt not to fall on my face during the slippery descent. 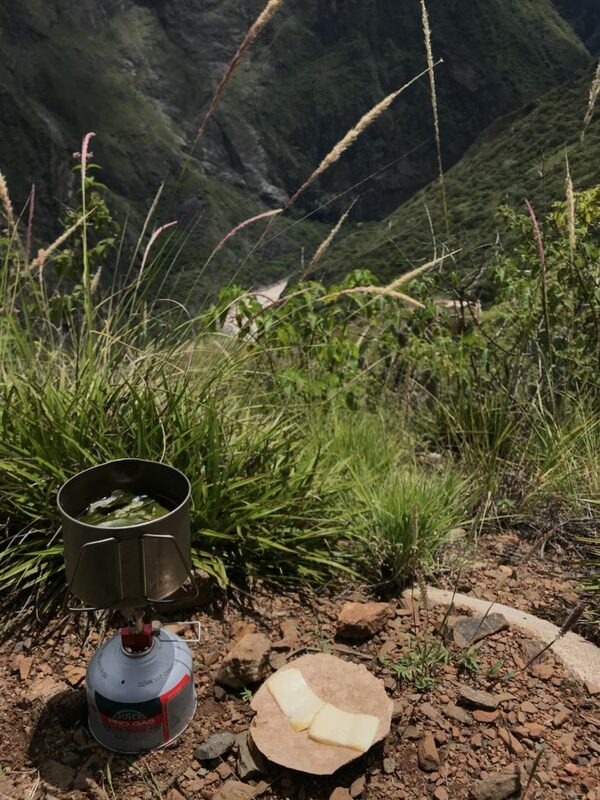 Several miles later, I am basking in the unexpected, full-force sunshine, as I wait for my trusty Pocket Rocket stove to heat water for Coca tea. 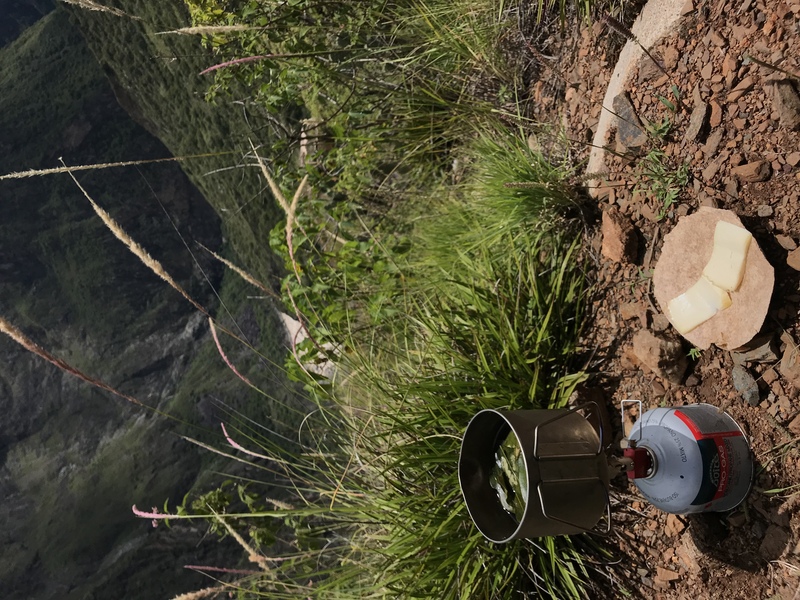 The Apurímac river surges down below me and I salute it with my cheese wrapped in a tortilla, before jamming it into my mouth. I have already consumed elevenses and luncheon, and now I am demolishing afternoon tea. The high altitude makes me ravenous and trail food does little to quell the insatiable hunger. My gear is strewn between the fierce tribes of cacti around me, drying out from yet another night of torrential downpours. The mystic San Pedro cacti sneer down at my ratty socks and wet sleeping bag, displeased with their new neighbors. I will accept their rudeness, as the unpleasant alternative is sleeping in a wet bag tonight. 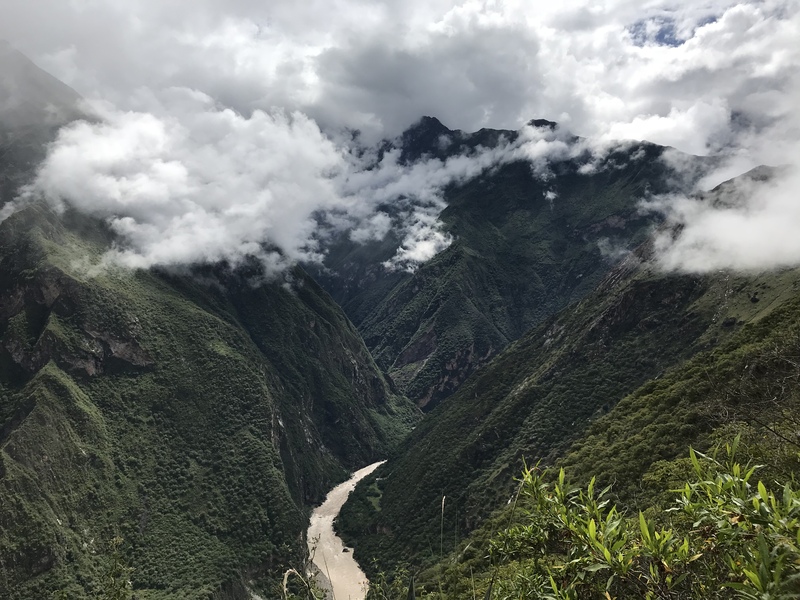 Not only am I solo backpacking in Peru, but doing it during the notorious rainy season. I am an anomaly if nothing else. 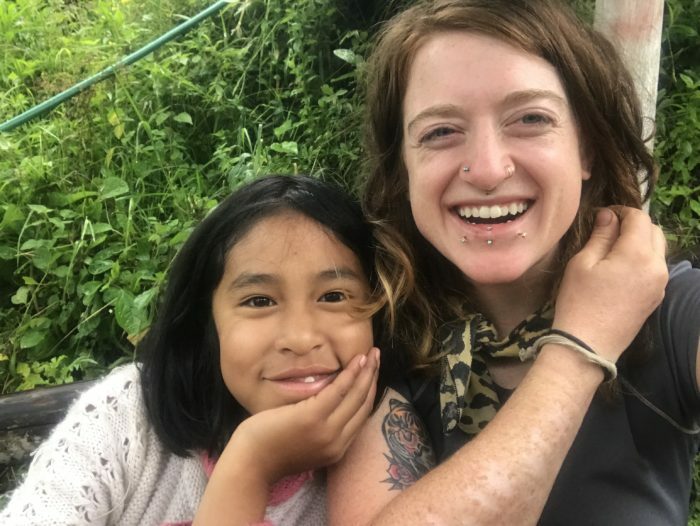 Any locals who cross my path grant me a look of surprise mingled with fear when they ask who I am traveling with and I reply, “Solo mi.” I relish the isolation; it gives me time to process all the lessons I have been learning in South America so far and opportunities to meditate on how to integrate those lessons into my life permanently. I eat more meals than Merry and Pippin when I hike. After snacking, I reestablish a loping pace down the slick and rocky path. Curly, pastel-green ribbons of Spanish moss hang down from tree branches, tickling my arms as I pass underneath. I can sense that I have almost reached the conclusion of my descent, the river roars territorially from somewhere up ahead. The trail finally levels out, but not before I slip in the mud and tear a jagged rip in my knee. Well, it was bound to happen eventually; to say I fall more than the average hiker would be a serious understatement. I pluck myself off the ground into a seated position and try to brush the muck off my wound, but only succeed in smearing more mud around in the process. The juxtaposition of my bright red life force swirling with the earth’s dark toned life force is mildly hypnotic. I lay back down, ignoring the muck, and gaze up through the canopy of trees. Sunlight seeps through the cracks between overlapping leaves, painting a unique pattern of warm sun rays on my freckled face. I close my eyes and breathe, sending out my gratitude to Pachamama (or as English-speakers call her, Mother Nature). Smiling serenely, I sit back up and reexamine my wounded knee. I decide to leave it be; my first aid kit is buried in my backpack and the trail beckons to me. It’s just a flesh wound. Since my first Pct adventure in 2016, I have shed my perceived exterior a multitude of times. I consider myself an onion, gradually peeling back one layer at a time, on the ultimate quest to discover myself and embrace the authentic being residing in my inner core. The loss of some of those layers makes me cry, some cause me to scream, some to laugh. All are pre-conceived notions placed on me by society, other people projecting onto me, or false identities I have adopted. The process is brutal, but one I am committed to. Who am I? I am a warrior. I am a survivor. I am stubborn as hell. I am a high school dropout. I am sometimes a mess. I am weird. I am gay. I am an advocate for all those hikers that don’t fit between the lines. I am proud of the person I am finally letting myself be. I am Matador. I am a thru-hiker.